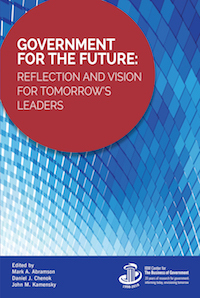 In the IBM Center’s new book, Government For The Future: Reflection and Vision for Tomorrow’ Leaders, part two of the book looks twenty years into the future envisioning the road ahead. This contribution is the next in a multi-part series, The Future of Artificial Intelligence, authored by David A. Bray. Imagine being able to visit a disability claims office in a digital environment. Imagine a patent examiner equipped with digital assistants that could do the bulk of administrative work behind processing patents. Artificial intelligence (AI) may make both of these scenarios a reality. Success of public service in the future depends on identifying beneficial ways to augment the extant human abilities of networked, cross-sector teams— who want to improve the delivery of public service—with digital assistants and learning machines to amplify the team’s strengths, mitigate any possible blind spots, and increase the capabilities of the team as a whole. The near-term future includes using AI in specialized applications to support the information and logistics functions traditionally performed by government to provide government services. For the near future, most machines will probably provide support that still requires a human to act or make a decision. For all the near-term future possibilities discussed below, government should implement “public review boards” that look at the diversity, consistency, and appropriateness of the data used. Without diverse or consistent data, the AI trained by the data may make decisions that erode public trust. Without appropriate use of data, public trust may also erode. Such activities would also involve outreach efforts by public service organizations, to increase digital literacy and the understanding of AI and what it can do. Following are some examples of how AI will be deployed in the near future. Increased Use of AI-Supported Assistance for Individuals Seeking Government Information. For example, several cities already have “311” telephone lines and mobile apps to assist individuals with non-emergency city services as well as to provide information on programs, events, and activities in the city. Increased Use of AI-Supported Assistance for Talent Management and Skills Matching. AI will help community members find new jobs and tailor training to hone and improve their skills for upward mobility in their jobs. Increased Use of AI-Supported Review of Public Applications and Filings. AI assistants will provide more tailored support to individuals, to better understand what they are applying for and pre-review a public application or filing prior to human approval. Increased Use of AI-Supported Legal, Financial and Ethics Reviews. An AI assistant will do the initial review, let an individual know if more information is required, and provide a preliminary result for final review by a human. Increased Use of AI-Supported Assistance for Analyzing Geospatial Data. AI can assist in making sense of geospatial information— for example, data from drones for civilian purposes, private cube satellites, and sensors associated with the “internet of things” -- as well as identifying patterns of importance to improve the delivery of public services. The medium-term future includes AI moving from specialized applications to embedding AI in all operations to support government and the decision-related functions done to improve public services. During this expansion, public service will need to solve growing cybersecurity challenges. A new science of understanding the resiliency, and by extension the brittleness, of AI apps to disruption by false data or other exploits will need to be developed if both the public and the public service workforce is to trust interactions with AI. Following are some examples of AI-enabled public services. Use of AI-Enabled Delivery of Materials and Provision of Transportation. This would allow public services to be paired with AI-enabled autonomous vehicles to include fire and emergency services. Use of AI-Enabled Robots to Offset Repetitive and Manually-Intensive Work. This will include using AI for civil construction efforts, disaster response, healthcare, or other public functions. Use of AI-Enabled Digital Assistants to Detect and Help Understand Biases. AI will help hold up a “digital mirror” to compare decisions and help to understand where biases are and what to do. Use of AI-Enabled “Digital Twins" of Real-World Dynamics. AI will allow public service organizations to build models of real-world dynamics—either of actual physical assets or social interactions. Such models will create highly accurate “digital twins” that would allow individuals in public service to experiment with certain scenarios in a digital environment. In 2030 and beyond, there are “farther out” ideas for the future of AI in public service. Advances will continue in the speed, size, and scale of computing to enable faster delivery of all the assisting and enabling functions of public service. The adoption of quantum computing, sophisticated augmented reality, and other techniques will be used to fundamentally transform the role of government to a more personalized approach in which government can respond to the unique needs of each citizen. The ability for AI to work with and help humans better act, respond, and provide public services should be fairly robust by this point. Functions that used to be provided solely by government agencies may now be provided either through a “Public Service Corps” willing to spend some hours a week on efforts assigned to them by a coordinating public service AI. In such a future scenario, several of the rote and repetitive functions currently performed by government would be performed by AI in a semi-automated fashion such that applications associated with civil society activities are pre-screened and feedback provided to human applicants prior to a final human determination. Humans will still be involved for the more creative and final decision roles. AI can match humans into different ad-hoc teams to fit a specific public service goal or problem set. If an emergent event or crisis occurs, AI can help identify who is available to assist with what activities—and even help coordinate humans and machines to assist with the response to the event. AI can learn which humans work better on specific tasks with other humans, and AI may even be able to identify which robots or parts of the AI hardware might be faulty or near-failing and thus need repair. Such a future would represent a major disruption to how government and public service currently function. AI technologies reflect the choices we humans make about how to use it, whom to include, and how to ensure the diversity, consistency, and appropriateness of AI’s activities within civil societies. With an environment that encourages informed experimentation and appropriate safeguards to protect the public, government can leverage AI over time and improve how civil society operates for the future ahead.